Actual Size 1 1/4" x 1 1/4"
Create a Memento in a Moment! Possibilities abound with this mini ribbon Purse Top. Use ribbon, brocade, vintage fabric, old silk from ties, scarves, handkerchiefs, dresses, or shirts--just to name a few. Then embelish your creations with beads, buttons, charms, fancy trim, or silk embroidery. 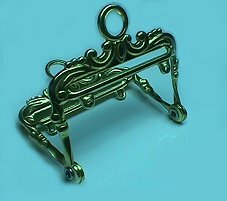 These Purse Tops can be used on a chatelaine, as a pin, or worn as a necklace. Small treasures and keepsakes will be kept safe at hand in this quick, simple, and functional purse. The possibilities are simply endless! Have you created a mini ribbon purse that you're especially proud of? Email us a photo and we'll add you to the gallery. . . The mini ribbon Purse Top has quickly become one of Small Wonders' best-selling items. Everyone loves the versatility with which they can be created and worn. Come browse the gallery for some wonderfully unique examples of what you can do. Patterns are for use with felt, ultra suede, leather, pleather, etc. Adjustments may be made to bottom portion of pattern; slots should be constructed as shown. Arrows point to hinge placement. These instructions are included with each purse top. How to make a purse using ribbon or brocade. Material needed: 2"x5" or2"x6" piece of fabric. Take each end of the ribbon or fabric and run them into the outside slots, folding the corners to get the ends started. Pull ends into center. Adjust ribbon to form the purse. the ribbon ends will be tucked inside to make the lining. Stitch up the sides far enough to cover the hinge end. Fabric may be sewn to the hinge and to the top bars to secure the purse in place. Your purse is completed!
. . . Or maybe not. Before sewing up the sides, you may wish to embelish or embroider your purse. If you decide to use fabric, give a half inch allowance on each side for a finished edge to make the two inch width. Variations to this purse are infinite. Look in antique stores for old watch fob chains with swivels to make a unique necklace.